Apple Self Service – a turbo-charged app catalog. For all your end user’s needs. Self Service let’s you help users help themselves. Better access, speed and availability make for a stronger end-user experience. Taking the app catalog to a whole new level, Jamf Self Service empowers end users with instant access to resources, content and trusted apps through a single click – no help desk tickets needed. More than an enterprise app store on demand. Give users what they want, when they want It. Make Self Service your own. Self Service no longer looks like it comes from Jamf; it looks like it comes from you! 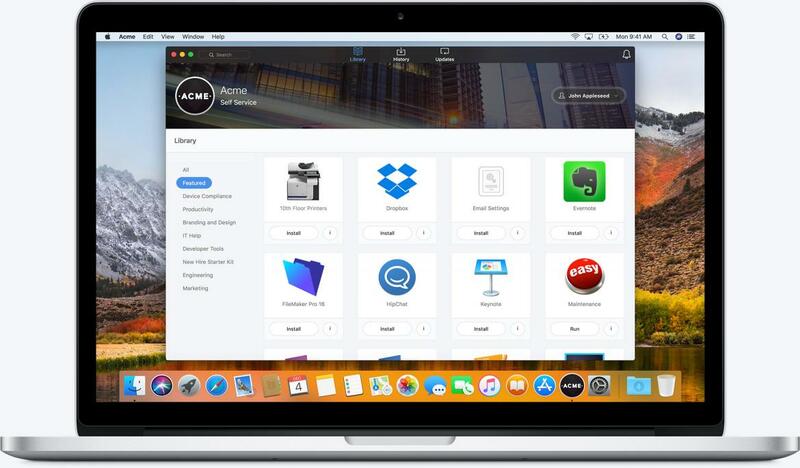 Your one-stop-shop for Mac updates, app installs and resources to help users be more productive is now completely customizable with your branding. Swap in your banner, logo or dock icon. Learn how to replace routine help desk tickets with on-demand, user-initiated actions. Check out how Ping Identity employees decide what applications they want, and when – all without help from IT. What’s in it for IT. What’s in it for users. With the Self Service feature, Jamf has stopped the flood of help desk requests by allowing our employees to take care of IT themselves. With technology seemingly everywhere, a new generation of employees seeks a seemingly modern technology experience at work. This shift in employee mentality is prompting IT to reevaluate the definition of IT service, and the practices and workflows they deploy to users. The question is how does IT shift their practices to embrace the user-centric trend? Download this e-book for answers. Take Jamf Pro for a free test drive and tell us what you think.